Neil Young and Steven Stills performed “BlueBird” together at the Light Up the Blues concert Saturday night that benefits Autism Speaks. The concert was held at the historic Hollywood Pantages Theatre in Hollywood, Clif. hosted by Kristen and Stephen Stills. They have a son with autism who has become a highly-talented filmmaker. Chris Stills says his brother is his main inspiration and why he became a producer of the concert. Jack Black was the emcee for the annual event’s third year in raising awareness and money for the cause. Also joining the jam were talented artists with autism, such as Nick Guzman. Stephen Stills, Neil Young, Don Felder, Shawn Colvin, Steve Earle, The White Buffalo and Chris Stills team up for the 3rd Light Up the Blues Concert to benefit Autism Speaks! The evening celebrated Autism Awareness month. Neil Young & Stephen Stills together for all songs playing with a house band that including Doug Pettibone. 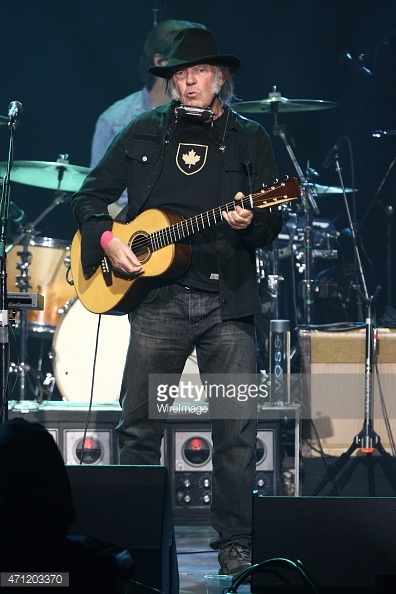 Rockin’ In The Free World included Shawn Colvin, Steve Earle, Chris Stills and others. Despite earlier reports, Buffalo Springfield will not be hitting the road early next year after canceling plans to tour this fall. And Stephen Stills says they probably won’t tour for a while. He tells us, “Neil [Young] started a book and said, ‘Don’t mess with the muse, man. '” Stills adds that he’ll probably tour next summer with Crosby, Stills and Nash. Buffalo Springfield reunited in 2010 for Neil Young’s annual Bridge School benefit and then played seven shows this past June — six in California and the Bonnaroo Festival in Tennessee. CSN was scheduled to play shows at New York’s Beacon Theatre tonight and tomorrow, but will perform only tomorrow night, as tonight’s show has been pushed to November 6th with a second show to be announced. IMHO, ED2: they talk to much, that’s what might shy others off. Stephen Stills and Richie Furay of Buffalo Springfield talk in this CNN video about touring together for the first time in 40 years. Goto CNN.com for the video. by Neil Young, Wired Mag interview with Ted Greenwald, March 2004.